After a bit of laziness and illness (and August snow), I wanted something mindless to get back in the groove. No rock shoes, no headlamp, just music and terrain I could jog. The Ritter range doesn’t offer such things, but the ridge connecting Minaret Summit to Carson Peak above June Lake looked about right. 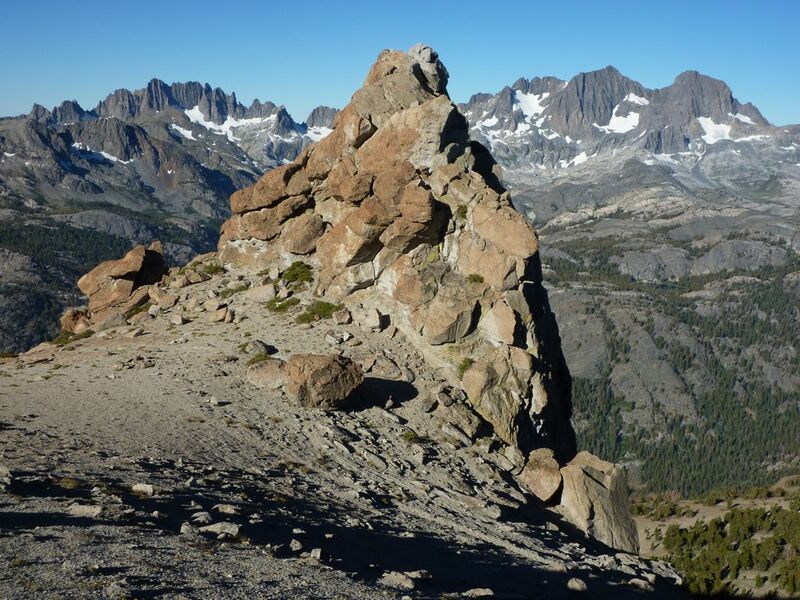 I could start at Minaret Summit (excellent dirtbag camping), do the ridge to Carson, then drop west to the PCT and cruise back to Minaret Summit via Agnew Meadow and the road. It looked like about 20 miles (and turned out to probably be a bit more), but with many joggable sections and water sources after dropping off the ridge, I could use my running setup: a belt pack with 1 bottle (refilled twice), fig newtons (900 cal), ibuprofen, and salt pills (used 1 of each). I started with gloves and a windbreaker, but it was soon warm enough for shorts and t-shirt. The views of the Minaret range are as good as promised, and the first few miles along the jeep road are compact and well-graded enough to jog almost the whole stretch. I could have driven the road, I guess. Once you pass the 4WD trailhead, you enter the barren volcanic hellscape: every type of annoying lifeless volcanic terrain you can imagine including sand, pumice, tufa, basalt rubble, and combinations of the above. The sand and pumice were runnable on flat and downhill sections, but running the basalt rubble was impossible. Nota bene: What looks like two teats is not, in fact, Two Teats; rather it is a right teat and some other high point to its northwest, perhaps San Joaquin. The left teat is the pointy thing. I climbed it first, finding surprisingly exposed 3rd class scrambling going up the north side, and an unexposed 4th class move down the south. There was no register on either summit, so took some pictures of weird rocks and continued slowly along the fading use trail to San Joaquin. I found a benchmark and an old snack can, then started down the awful, loose red talus before wising up and traversing west to some pumice and sand. The walk — most of it is unrunnable thanks to weird, intermittently-soft dirt — to Carson is long but straightforward, and the view over its sheer north face to June Lake and Mono Lake is impressive. The register also had a number of interesting entries, including one possibly from a Russian mail-order bride business. I expect that kind of thing on the internet, not in summit logs. I met two guys hiking Carson via Rush Creek, who confirmed that the gully down to the southwest of Carson worked, then dropped down into a mixture of boulders, dirt, and scraggly meadows just north of the east-west cliffs. I eventually reached some stagnant ponds with late-blooming thistles, one of which had a trail along one side. Following a maze of trails and staying west, I eventually found a particularly dusty and manure-strewn one, and knew I was on the right path. Unfortunately, both the JMT and PCT seem to be popular horse routes here. I had hoped to cut up from the PCT / High Trail to the ridge near Deadman Pass, but the bushwhack up to the ridge looked worse than a drop down to Agnew and a hike along the road. I kept myself amused and motivated by racing a cyclist up the road, finally reaching the car later than I had expected, sporting a robust dirt tan. This entry was posted in California, Ultra. Bookmark the permalink. I love the photo “Trail to the two teats” Not the name so much as the smooth shapes and trail. It looks wonderful to run – but I guess not? Actually that part and most of the road before it were quite nice. The pumice wasn’t too soft there.